Bustle is a popular news, entertainment, lifestyle, and fashion site for young women. Minoo Shirazi, the protagonist of our own Persia Blues graphic novels, makes the list! And she’s in good company, alongside Batwoman, Martha Washington, Black Orchid, and many other great female characters. Thanks KT, we couldn’t agree more! 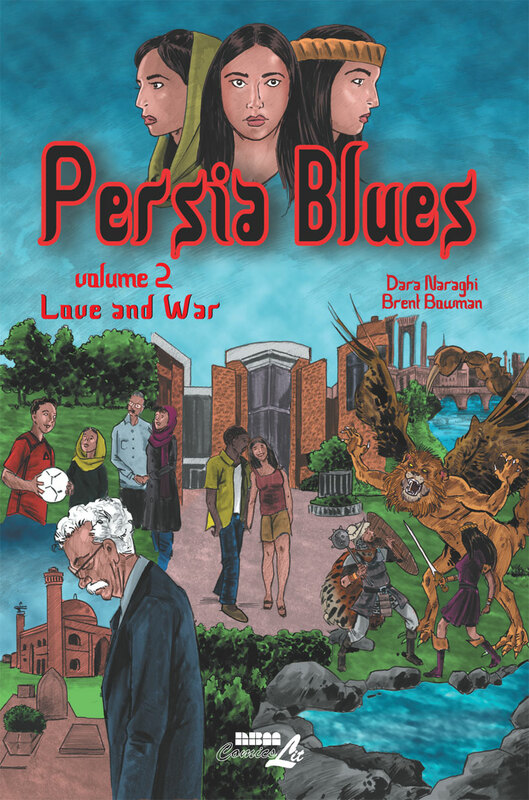 Derek Royal from the The Comics Alternative podcast conducts an insightful and lengthy interview with yours truly and artist Brent Bowman about Persia Blues vol. 2. Click the link above to listen to our talk, and be sure to check out all the other great interviews and reviews at The Comics Alternative. 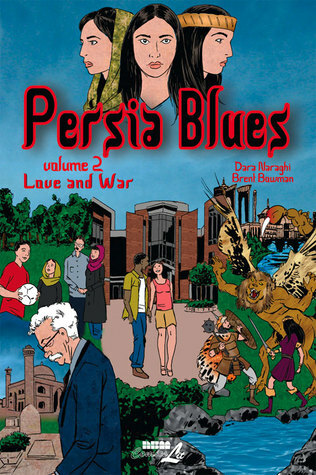 Haven’t bought your copy of Persia Blues vol. 2 yet? Would you like the chance to win a copy, signed by both myself and artist Brent Bowman? What if I told you it will also contain an original sketch by Brent? And that there are no strings attached? Have you ever wondered how the writers and artists of the books you read sound like? Of course not. But that didn’t stop us from sitting down with John Orlando for his PVDcast podcast! Brent Bowman and I talk about Persia Blues vol. 2, our process for collaborating together, sources of inspiration, what took so long on my part to complete the script for the second book, and much more. Head on over to the home of the PVDcast to hear our episode. And while you’re there, be sure to check out John’s archive of great interviews with creative types of all sorts, from writers and artists to wrestlers and movie critics. 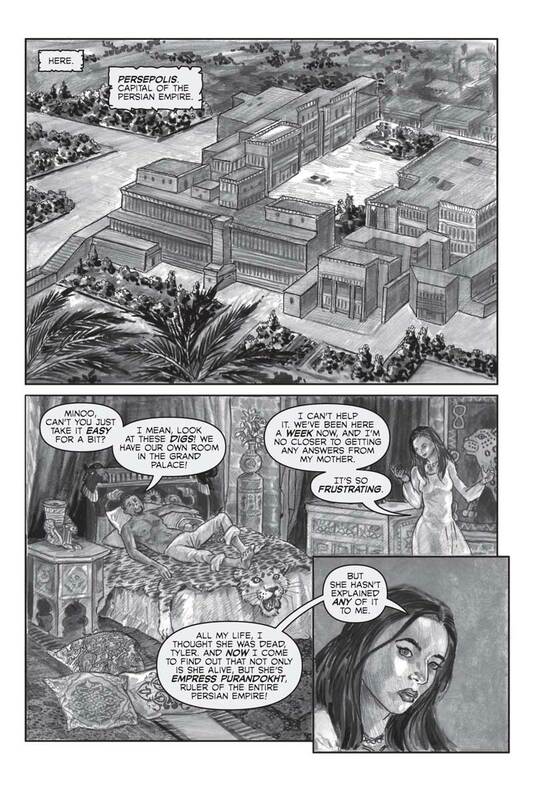 This combination noir and penny-dreadful background is apparent in the pages of Persia Blues, which alternates visual styles: ancient Persia is dark and moody, as if the story is coming to us from a great distance full of smudged shadow and deep recesses of sky; modern Iran is primarily depicted in line drawings with brightly lit, page-white backgrounds, as if we are watching reality TV. I like the author’s theory as to the central mystery of the book’s dual settings. I won’t say whether he’s on the right track or not, but give it a read and see if you agree. Or do you have your own theories? I, along with co-creator and artist Brent Bowman, were honored to have Persia Blues vol. 1 win the 2014 S.P.A.C.E. 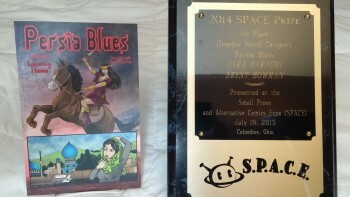 Prize for best graphic novel at the Small Press & Alternative Comics Expo. And I’m even happier to announce that the long-awaited second volume of the trilogy is hitting the shelves in a week or so! Minoo Shirazi’s mysterious double life continues to unfold across 2,000 years of history in the second installment of the Persia Blues series. In the fantastical world of ancient Persia, the shock of discovering a piece of her past is overshadowed by the imminent invasion of Ahriman’s armies. Only by finding the empire’s champion, Rostam, can she hope to turn back the tide of evil. While in the modern world, Minoo’s life unfolds in Iran and America – where she has recently begun her graduate studies – as she deals with her stern father, dying mother, lost brother, and new American boyfriend. Across myths and modern realities, we delve deeper into the truth of Minoo’s life. Check back soon for more on the world(s) of Persia Blues. I’m thrilled to announce that Persia Blues, my graphic novel with artist Brent Bowman, published by NBM, has won the 2014 SPACE Prize in the graphic novel category! As in previous years, the winners were picked by two rotating judges and the registered SPACE 2014 exhibitors themselves. I’d like to extend my congratulations to the winners in the other categories, as well as all the nominees. This book has been a true labor of love for me, and Brent and I have poured a lot of our time and energy into its creation. As I’ve mentioned elsewhere, in creating Persia Blues, I wanted to showcase a little of Iran’s rich culture, from cuisine to architecture to literature, and also give readers a sense of its thousands of years of history and tradition. 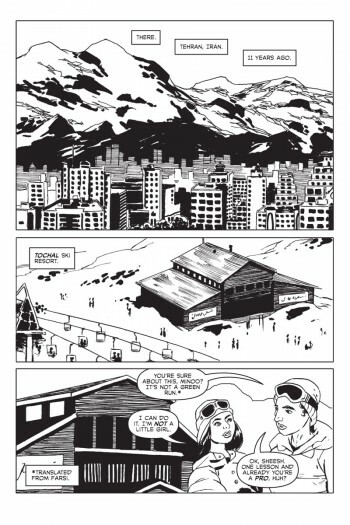 But more importantly, I wanted to tell a very human story, featuring a smart, capable, complex protagonist. We will have an art display at this year’s S.P.A.C.E., showcasing original art from the upcoming vol. 2 of the book. The show takes place in Columbus, Ohio on April 11 & 12, 2015. So if you’re in our neck of the woods, drop on by the show and say hi. Now coming up on its 16th year, S.P.A.C.E. (Small Press & Alternative Comics Expo) is the Midwest’s longest running exhibition of small press, creator owned, and art comics. It’s also Columbus’ only locally owned and operated comics show. Sponsored by Back Porch Comics.